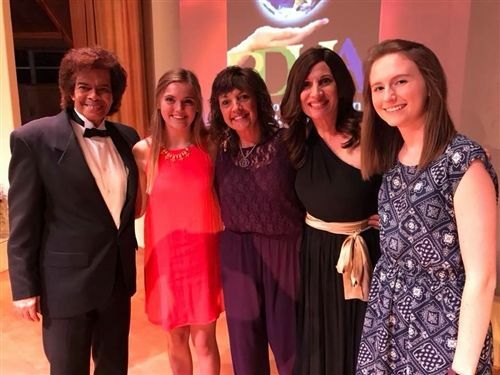 Friday, April 13, Shorecrest students Elizabeth Hodgson '18 and Lily Schneider '19 each received People of Distinction Humanitarian Awards for their work with the Kind Mouse, a local non-profit that helps to feed chronically hungry children in the St. Petersburg area. The Shorecrest students were two of the 21 honorees from all over the country recognized at the awards presentation at First Unity Spiritual Campus. Elizabeth and Lily both work closely with Kind Mouse founder, Gina Wilkins, as Mice Interns, a program for students age 13-18 to plan and participate in monthly outreach activities that support the mission of Kind Mouse. Elizabeth served as 2017 Mice Interns President. Lily has moved into the role for 2018. Elizabeth was honored for creating a plan to address "food shaming" in school cafeterias. She explains, "When children and teenagers don’t have the same high quality lunch or any lunch at all, bullying can result from misconceptions about hunger and its causes." Elizabeth's plan involves video PSAs, education, mentoring, and outreach to encourage positivity, tolerance, and compassion. The Mice Interns hope to launch the plan in the near future. Lily is working to establish a community garden to grow fresh fruits and vegetables to offer more nutritional food options for Kind Mouse families. Lily states, "These chronically hungry children are digging through dumpsters and searching the streets for their next meal. Often, the hungry teenagers must provide for their younger siblings by working multiple jobs, while still attending high school." Both Elizabeth and Lily work with students in the Kind Mouse "Mice in Training" program, an outreach group for young children interested in helping feed their communities. Gina Wilkins, an architectural draftsperson by trade, saw the need of local hungry children and hardworking career families falling on economic hard times. Founded in 2012, the Kind Mouse has filled more than 168,000 little tummies each weekend, countless homeless students have been provided emergency meals and over 200 hardworking families and their pets have been given 90 days’ worth of food. Learn more about the Kind Mouse at www.thekindmouse.org.